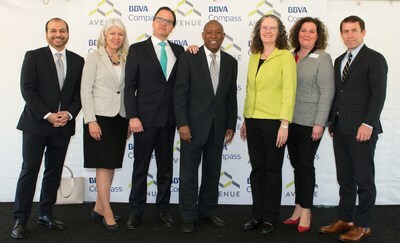 (Left to Right) BBVA Compass Director of Communications and Responsible Business Rey Ocañas, Avenue Board of Trustees President Cassandra Silvernail, BBVA Compass CEO and Country Manager Javier Rodriguez Soler, Houston Mayor Sylvester Turner, Houston City Councilwoman Karla Cisneros, Avenue Executive Director Mary Lawler, Houston Housing and Community Development Director Tom McCasland, BBVA Compass Houston CEO Mark Montgomery, and BBVA Compass Director of Community Lending Mortgage Viola Solomon ceremonially break ground at the Avenue Center press conference on Monday, April 15, 2019. (Left to Right) BBVA Compass Director of Communications and Responsible Business Rey Ocañas, Houston City Councilwoman Karla Cisneros, BBVA Compass CEO and Country Manager Javier Rodriguez Soler, Houston Mayor Sylvester Turner, Avenue Executive Director Mary Lawler, Avenue Board of Trustees President Cassandra Silvernail, and Houston Housing and Community Development Director Tom McCasland at the Avenue Center groundbreaking press conference. 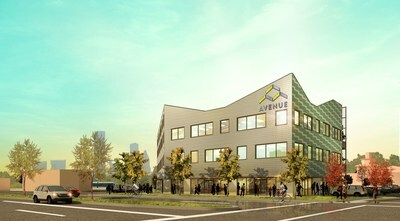 A rendering of Avenue Center.